Our Privacy Statement is incorporated in these Terms of Service. Please note the arbitration provision set forth below, requiring you to arbitrate any claims you may have against Places Journal on an individual basis. Arbitration on an individual basis means that you will not have, and you waive, the right for a judge or jury to decide your claims, and that you may not proceed in a class, consolidated, or representative capacity. The content on the Website, including but not limited to text, photographs, images, videos, audio files, and software, (collectively, the “Content”) is protected by United States and international copyright laws and other intellectual property laws. It is intended for your personal, noncommercial use. You may not duplicate, modify, publish, reproduce, distribute, or in any way exploit the Content, in whole or in part, without the express written consent of the copyright holder(s) of the respective work. If you wish to inquire about permission to reprint, translate, or excerpt an article, notify us at [email protected]. You acknowledge that Places Journal does not make any representations or warranties about the Content, including without limitation, about its accuracy, integrity, or quality. You understand that by using the Website, you may be exposed to Content that is offensive, indecent, or objectionable. Under no circumstances is Places Journal liable in any way for any Content, including, but not limited to: any infringing Content, any errors or omissions in Content, or for any loss or damage of any kind incurred as a result of the use of any Content posted, transmitted to, linked to, or otherwise accessible or made available via the Website. The names, trademarks, service marks, and logos of Places Journal belong exclusively to Places Journal and are protected from reproduction, imitation, dilution or confusing or misleading uses under national and international trademark and copyright laws. Any other trademarks, service marks, and logos (including third-party product names) are the property of their respective owners. The use or misuse of these trademarks is expressly prohibited and nothing stated or implied on the Website confers on you any license or right under any trademark of Places Journal or any third party. The Website is not intended for use by persons under the age of 13. Places Journal does not knowingly collect information from visitors under the age of 13 and, in the event that we learn that a person under the age of 13 has provided us with personal information, we will delete such personal information. By submitting Content to the Website, including but not limited to essays, articles, and photographs, as well as user-generated content such as topical reading lists (collectively, “Submissions”), you are consenting to its display and publication on the Website, and to its transmission and republication in other forms. You acknowledge that your Submissions may be edited and modified by Places Journal, and you waive any rights you may have in having the Content altered or changed in a manner not agreeable to you. You grant Places Journal a perpetual, nonexclusive, worldwide, royalty-free license to the Submissions, which includes without limitation the right for Places Journal to use, copy, transmit, excerpt, publish, distribute, creative derivative works of, host, index, cache, tag, encode, modify, and adapt your Submissions with no further compensation to you. You may only submit Content to the Website that you have the right to submit. This means that you can only submit Content that you yourself create, that is in the public domain, or that you have been expressly granted the right to submit. You warrant that no Submission violates or infringes upon the rights of any third party, including copyright, trademark, privacy, publicity, or other personal or proprietary rights, or contains libelous, defamatory, or otherwise unlawful material. 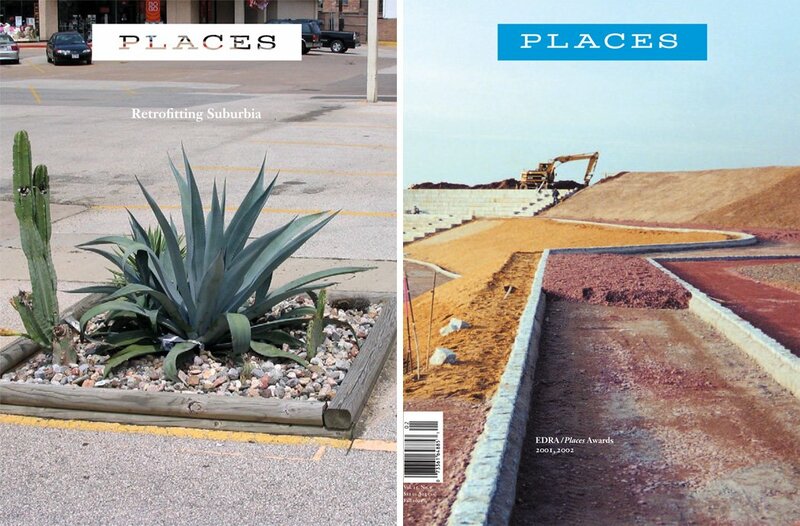 Places Journal may, but is not obligated to, review your Submissions and may delete or remove (without notice) any Content that Places Journal, in its sole discretion, determines violates the Terms or that may be offensive, illegal, or that might violate the rights, harm or threaten the safety of others. Places Journal does not endorse or support any Content posted by you or any other third party on or through the Website. You alone are responsible for creating backup copies of your Submissions. You may request the removal of your Content from the Website at any time, and we will take reasonable steps to promptly remove such Content. This Privacy Statement is effective as of May 10, 2018. Name and email address. When you sign up to receive updates from Places Journal or register a user account, or when you provide personal information in connection with your participation in any of our public events, we may collect your name and email address. Payment information. When you donate money, in addition to your name and email address, we collect your billing address and payment information. All credit card information is gathered and stored by Stripe.com or Paypal.com, and we do not view your credit card number. When you donate money to Places Journal, your name may be published on our donors page unless you request otherwise. University, institution or location. When you create a registered user account, you may provide your university or institution affiliation or location. Usage information. When you access and interact with the Website, our servers (which may be hosted by a third party service provider, in the United States or anywhere in the world) may collect information indirectly and automatically (through, for example, the use of your “IP address”) about your activities while visiting the Website and information about the browser and device you are using. We do not link browsing information or information from our server logs to the other personal information you submit to us. Essential. Some cookies are essential in order to enable you to move around your websites and use their features, such as accessing secure areas of the Website. Without these cookies, we cannot enable appropriate content based on the type of device you are using. Browsing and functionality. These cookies allow us to remember choices you make on the Website, such as your preferred language and the country from which you are visiting, and provide enhanced, more personalized features. Facebook: You should see a link to the opt-out when you select “Why am I seeing this?” when using Facebook. You can also select “Hide all from this advertiser” within Facebook to stop seeing our ads. More information can be found on Facebook’s site. Instagram: Your choices in your Facebook ad preferences and ads settings determine your settings for Instagram. Third party advertising and social media. We allow other third parties to place cookies on our Website to allow them to show you advertisements off our Website that are more relevant and useful to you. These advertisers and other third parties (including the ad networks, ad-serving companies and other service providers they may use) may assume that users who interact with or click on a personalized ad or content are part of the group that the ad or content is directed toward. There are several ways to manage cookies. You can instruct your browser to refuse all cookies or to indicate when a cookie is being sent. The Help feature on most browsers provide information on how to accept cookies, disable cookies or to notify you when receiving a new cookie. Please note, however, that by blocking or deleting cookies which are “strictly necessary,” you will not be able to access certain features of our Website. In the U.S., the Network Advertising Initiative also offers a means to opt-out of a number of advertising cookies. Please visit the Networkadvertising.org to learn more. Note that opting-out does not mean you will no longer receive online advertising. It does mean that the company or companies from which you opted-out will no longer deliver ads tailored to your preferences and usage patterns. For other legitimate business reasons. We do not knowingly collect any information from children under the age of 13. In the event that we learn that a person under the age of 13 has provided us with personal information, we will delete such personal information. With third parties in a good faith belief that such disclosure is reasonably necessary to (a) take action regarding suspected illegal activities; (b) enforce or apply our Terms; (c) comply with legal process, such as a search warrant, subpoena, statute, or court order; or (d) protect our rights, reputation, and property, or that of our users, affiliates, or the public. We communicate with users who subscribe to our services on a regular basis via email. For example, we may use your email address to send you a thank you for your donation, information about changes to our services and other disclosures as required by law. Generally, users cannot opt-out of these communications, but they will be primarily informational in nature rather than promotional. We do provide you with the opportunity to opt-out of marketing communications from us, such as emails or updates regarding new services offered on the Website, by clicking the “unsubscribe” link within the text of the email or by contacting us at [email protected]. We will process your unsubscribe as soon as possible, but please be aware that in some circumstances, you may receive a few more messages before the unsubscribe is processed. This Privacy Statement applies solely to information collected on the Website. The Website may contain links to other websites. We are not responsible for the privacy practices or the content of these other websites. If you have any questions about how these other websites use your information, you should review their policies and/or contact them directly. We have implemented reasonable measures to protect against unauthorized access to and unlawful interception or processing of personal information that we store and control. However, no website can fully eliminate security risks. Third parties may circumvent our security measures to unlawfully intercept or access transmissions or private communications. We will post a reasonably prominent notice to the Website if we are aware of any such security breach. Depending on where you live, you may a legal right to receive notice of a security breach in writing. In the event that all or part of our assets are sold or acquired by another party, or in the event of a merger, you grant us the right to assign your personal information collected via the Website. We reserve the right to amend this Privacy Statement from time to time. We will notify you of material changes to this Privacy Statement by posting a notice on our home page for a reasonable period of time and changing the “effective” date above. Your continued use of our Website following the posting of changes will constitute your acceptance of the changed terms. Any questions or concerns you have about this Privacy Statement can be sent to [email protected]. All information you provide in any written communication will also be covered by this Privacy Statement. k. Post or transmit any personally identifiable information about persons under 13 years of age. By registering for an account on the Website, you warrant that you are the age of majority in your jurisdiction, or are over the age of 13 and have the express permission of a legal guardian to become a registered user and use services made available to registered users, and you further agree to abide by all the Terms. You agree to (a) provide accurate, current, and complete information about you, if and as may be prompted by the registration process on the Website, (b) maintain the security of your password and identification, (c) maintain and promptly update your registration information and any other information you provide to Places Journal, and to keep it accurate and complete, and (d) be fully responsible for all use of your account and for any actions that take place using your account. Places Journal reserves the right to modify or discontinue the accounts of registered users and related services at any time. Places Journal disclaims any and all liability to registered users and third parties in the event Places Journal exercises its right to modify or discontinue user accounts or related services. In addition, Places Journal may, at any time: (a) modify, suspend, or terminate the operation of or access to your user account for any reason; (b) modify or change the Website and any applicable Terms and policies governing your user account and the related Website for any reason; and (c) interrupt user accounts and the related Website for any reason, all as Places Journal deems appropriate in its discretion. Your access to your account, and use of the related Website may be terminated by you or by Places Journal at any time and for any reason whatsoever, without notice. In addition, we reserve the right to delete and purge any account and all Content associated therewith following any prolonged period of inactivity, all as may be determined by Places Journal in its complete discretion. We abide by the federal Digital Millennium Copyright Act (DMCA) and will respond to notices of alleged infringement that comply with the DMCA and other applicable laws. As part of our response, we may remove or disable access to material residing on the Website that is claimed to be infringing, in which case we will make a good-faith attempt to contact the person who submitted the affected material so that they may make a counter notification, also in accordance with the DMCA. Before serving either a Notice of Infringing Material or Counter-Notification, you may wish to contact a lawyer to better understand your rights and obligations under the DMCA and other applicable laws. The following notice requirements are intended to comply with Places Journal’s rights and obligations under the DMCA and do not constitute legal advice. e. A statement, under penalty of perjury, that the information in the notification is accurate and that you are authorized to act on behalf of the owner of the exclusive right that is alleged to be infringed. Then send this notice to: [email protected] or Places Journal, 912 Cole Street, #171, San Franciso, CA 94117. Then send this notice to: [email protected] or Places Journal, 912 Cole Street, #171, San Francisco, CA 94117. TO THE FULLEST EXTENT PERMITTED BY THE APPLICABLE LAW, PLACES JOURNAL OFFERS THE WEBSITE AS-IS AND MAKES NO REPRESENTATIONS OR WARRANTIES OF ANY KIND CONCERNING THE WEBSITE, EXPRESS, IMPLIED, STATUTORY OR OTHERWISE, INCLUDING, WITHOUT LIMITATION, WARRANTIES OF TITLE, MERCHANTABILITY, FITNESS FOR A PARTICULAR PURPOSE, OR NONINFRINGEMENT. PLACES JOURNAL DOES NOT WARRANT THAT THE FUNCTIONS OR CONTENT CONTAINED ON THE WEBSITE WILL BE UNINTERRUPTED OR ERROR-FREE, THAT DEFECTS WILL BE CORRECTED, OR THAT OUR SERVERS ARE FREE OF VIRUSES OR OTHER HARMFUL COMPONENTS. PLACES JOURNAL DOES NOT WARRANT OR MAKE ANY REPRESENTATION REGARDING USE OR THE RESULT OF USE OF THE CONTENT IN TERMS OF ACCURACY, RELIABILITY, OR OTHERWISE. EXCEPT TO THE EXTENT REQUIRED BY APPLICABLE LAW AND THEN ONLY TO THAT EXTENT, IN NO EVENT WILL PLACES JOURNAL, ITS EMPLOYEES, OFFICERS, DIRECTORS, AFFILIATES OR AGENTS (“THE PLACES JOURNAL PARTIES”) BE LIABLE TO YOU ON ANY LEGAL THEORY FOR ANY INCIDENTAL, DIRECT, INDIRECT, PUNITIVE, ACTUAL, CONSEQUENTIAL, SPECIAL, EXEMPLARY OR OTHER DAMAGES, INCLUDING WITHOUT LIMITATION, LOSS OF REVENUE OR INCOME, LOST PROFITS, PAIN AND SUFFERING, EMOTIONAL DISTRESS, COST OF SUBSTITUTE GOODS OR SERVICES, OR SIMILAR DAMAGES SUFFERED OR INCURRED BY YOU OR ANY THIRD PARTY THAT ARISE IN CONNECTION WITH THE WEBSITE OR SERVICES (OR THE TERMINATION THEREOF FOR ANY REASON), EVEN IF THE PLACES JOURNAL PARTIES HAVE BEEN ADVISED OF THE POSSIBILITY OF SUCH DAMAGES. THE PLACES JOURNAL PARTIES SHALL NOT BE RESPONSIBLE OR LIABLE WHATSOEVER IN ANY MANNER FOR ANY CONTENT POSTED ON THE WEBSITE (INCLUDING CLAIMS OF INFRINGEMENT RELATING TO CONTENT POSTED ON THE WEBSITE, FOR YOUR USE OF THE WEBSITE, OR FOR THE CONDUCT OF THIRD PARTIES ON THE WEBSITE). YOUR SOLE AND EXCLUSIVE REMEDY FOR ANY DISPUTE WITH PLACES JOURNAL IS TO DISCONTINUE YOUR USE OF THE WEBSITE. IN NO EVENT SHALL OUR LIABILITY, OR THE LIABILITY OF THE PLACES JOURNAL PARTIES, FOR ANY AND ALL CLAIMS RELATING TO THE USE OF THE WEBSITE EXCEED THE TOTAL AMOUNT, IF ANY, PAID BY YOU TO PLACES JOURNAL TO ACCESS AND USE THE WEBSITE. You agree to indemnify and hold harmless the Places Journal Parties from and against any and all loss, expenses, damages, and costs, including without limitation reasonable attorneys fees, resulting, whether directly or indirectly, from your violation of the Terms. You also agree to indemnify and hold harmless the Places Journal Parties from and against any and all claims brought by third parties arising out of your use of any of the Website and the Content you make available via the Website by any means, including without limitation through a posting, a link, reference to Content, or otherwise. The Website may contain links to other websites. We are not responsible for the availability of these external sites nor do we endorse the activities or services provided by these websites. Under no circumstances shall we be held responsible or liable, directly or indirectly, for any loss or damage caused or alleged to have been caused to a user in connection with the use of or reliance on any content, goods or services available on such external websites. By using the Website, you and Places Journal agree that, if there is any controversy, claim, action, or dispute arising out of or related to your use of the Website, or the breach, enforcement, interpretation, or validity of these Terms or any part of them, other than disputes related to or involving Places Journal’s intellectual property (“Dispute”), both parties shall first try in good faith to settle such Dispute by providing written notice to the other party describing the facts and circumstances of the Dispute and allowing the receiving party thirty (30) days in which to respond to or settle the Dispute. Both you and Places Journal agree that this dispute resolution procedure is a condition precedent that must be satisfied before initiating any litigation or filing any claim against the other party. IF ANY DISPUTE CANNOT BE RESOLVED BY THE ABOVE DISPUTE RESOLUTION PROCEDURE, YOU AGREE THAT THE SOLE AND EXCLUSIVE JURISDICTION FOR SUCH DISPUTE WILL BE DECIDED BY BINDING ARBITRATION ON AN INDIVIDUAL BASIS. ARBITRATION ON AN INDIVIDUAL BASIS MEANS THAT YOU WILL NOT HAVE, AND YOU WAIVE, THE RIGHT FOR A JUDGE OR JURY TO DECIDE YOUR CLAIMS, AND THAT YOU MAY NOT PROCEED IN A CLASS, CONSOLIDATED, OR REPRESENTATIVE CAPACITY. Other rights that you and we would have in court will not be available or will be more limited in arbitration, including discovery and appeal rights. Any such Dispute shall be exclusively submitted to JAMS (www.jamsadr.com) for binding arbitration under its rules then in effect, and will occur in the San Francisco, California area, before one arbitrator to be mutually agreed upon by both parties. If you have any questions or concerns regarding the Website or these Terms, please contact us by email at [email protected].